Mark your calendars folks! 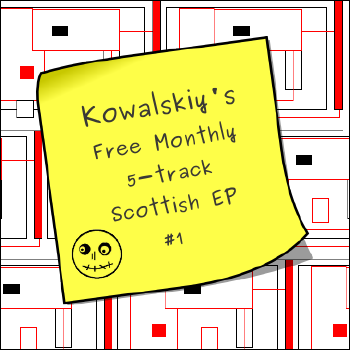 The 16th of each month shall forever be known as Kowalskiy's Free 5-track Scottish EP Day. Catchy, eh? From now on, I'll endeavour to bring you a free EP featuring 5 cracking exclusive/rare tracks from some of Scotland's best up-and-coming bands. For the first in what will hopefully be a series of many, I asked 5 of my favourite artists at the moment to contribute. For some reason I'm still trying to suss out, they all said a very enthusiastic yes! Thanks to each and every one of them for giving up their time, and song, to get this idea off the ground. I can't thank them enough! Anyway, for those who like the sound of it, the EP is now up for free download on my shiny new bandcamp site. Hope you enjoy it! As a warning to all you bands out there, I have a shortlist for EP #2 and I'll be in touch soon! Although if you have a mouthwatering exclusive or rare track and fancy appearing on a future EP, feel free to send me a wee email.